Count Your Blessings is probably one of the most popular Christian hymns in the world. I would not be surprised if it made the top Christian hymns of all-time list for millions of Christians. I have heard this song sang on television, radio, church etc. I remember one of the most popular musicians in my country included it in his album and it caught fire with millions singing along or listening to it. The author of this hymn is Johnson Oatman Jr. He was born on April 21, 1856 near Medford, New Jersey. His father was a local merchant who also happened to be a favorite singer in his town. He had a beautiful and powerful booming voice that captivated many people. 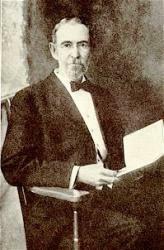 The young Johnson Oatman, Jr wanted above all else to follow in the footsteps of his father and be a musician. He wanted to grow up and be like his dad in many other respects besides music. He initially joined his father’s business as a junior member in the Johnson Oatman & Son firm. Due to this he did not have enough to fulfill his religious ambitions. He later studied for ministry in the Methodist church. While he tried his best in his work as an ordained minister in the Methodist church, he soon realised that it was not his thing. He had gone about preaching in various congregations in his area but was not happy. At the age of 35 he found his calling and never looked back. He realised that while he could not sing like his dad he could write hymns. Thus began a journey that led him to write 200 hymns a year and eventually wrote 5000 hymns. Thus he was able to find a way to "preach the gospel". Though his favorite hymns were the popular, "NO, Not One" and "Higher Ground" it was Count Your Blessings written in 1897 that had a meteoric journey. The words of this song were put to music by Edwin Othello Excell. Edwin Othello Excell was born December 13, 1851 in Stark County, Ohio. He too was pastor's kid. His father was Rev. JJ Excell was the minister in the German Reform Church in Ohio. I would guess that it must be a popular hymn during the Thanksgiving holidays in America. A very fitting song to remind us of the many blessings we experience daily. It is very easy to forget to Count Our blessings when we go through difficult times. The mind usually will focus on the slights and disappointments of life neglecting the multitude of good things that happen to us every day. Below are the lyrics of this beautiful hymn, Count Your Blessings. Count your many blessings, see what God hath done! Your reward in heaven nor your home on high.